The eastern edge of our yard is adjacent to a perennial creek. The other side of that creek is occupied by a strip of alluvial forest. Mature sycamores, river birches, water oaks, maples, sweet gums, and tulip poplars tower beside us — sentinels of our eastern border. Until recently, that forest climbed the ridge behind it, creating a wide swath of ideal habitat for wildlife. But my neighbor chose to have that ridge clear-cut two years ago. It was painful to hear and see the destruction of this healthy forest. I count myself fortunate that the giant machines wielding terrifying saws couldn’t cut the trees beside the creek. The ground was too soft and dissected by tributary streams. Now that time has healed the raw destruction, I have managed to find an up-side to this change in the neighboring forest. The bare ridge allows light to penetrate the remaining forest much more easily. Before the clear-cut, sunrises were almost non-events. Morning color was usually gone by the time the light had topped the trees. But now — now I am treated every non-cloudy morning to breathtaking winter sunrises. Bare branches and tall trunks of remaining border sentinels stand in dark silhouette against a varying canvas of color. Some mornings paint the sky with Easter egg pastels — pale lavenders and soft peaches. Some mornings set my eastern border on fire with vivid scarlets, neon magentas, and rich golds. What does this have to do with piedmont gardening? Everything, my friends. The piedmont environment of our homes and gardens was most likely forest before we all showed up. In my opinion, that forest must not be forgotten in the rush to build more strip malls and suburbs. Our native wildlife needs that forest. And we need some version of that forest to be connected to the heart of what this region has been and should remain. As I admire a succession of winter sunrises, I am daily reminded of the importance, power, and beauty of piedmont forest. 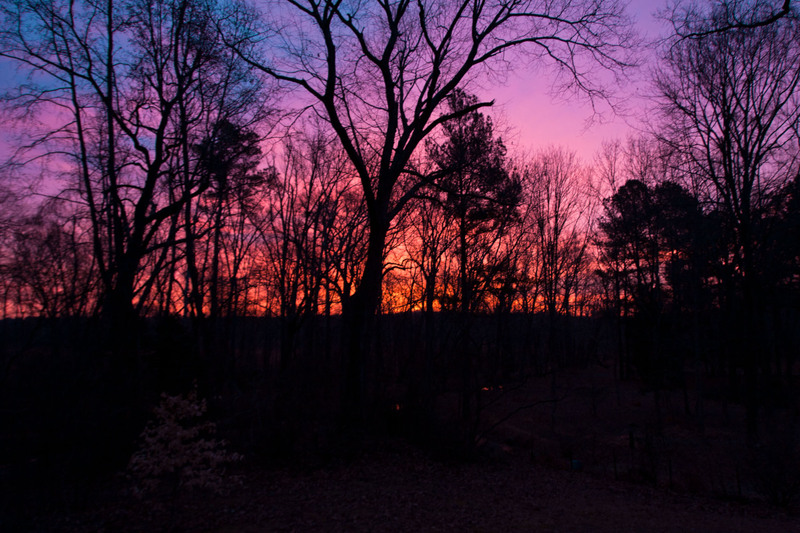 The image in the header at the top of this blog is a photograph of one of those sunrises. Wonder Spouse (and ace photographer) was kind enough to capture our eastern border framed in light. He tells me he plans to create headers for each season. I know they will all be as beautiful as this one. I thought you might like to see the photo from which he extracted the header. Enjoy this winter sunrise. And meditate with me on ways to incorporate the seasonal beauty and power of piedmont forest into our home landscapes. This entry was posted on January 23, 2011, 1:22 pm and is filed under piedmont gardening. You can follow any responses to this entry through RSS 2.0. You can leave a response, or trackback from your own site.